When you walk hand in hand with someone, well, it is pretty special. You trust the other person, choose a common pace and follow a shared goal, a real or imaginary one, it doesn’t make a difference, because what matters is the journey which always has surprises in store for you around every corner, bend or unexpected life event. Of all the hands that kept me safe, I have a vivid memory of those of my two grandfathers, Biagio and Remigio. They were very different, but had the same way of holding my hand: constant, reliable, reassuring. Being it in the park in San Gimignano or at the market in Colle, my little hand was well safe in their hands, and I followed them with confidence, hurrying to keep up the pace. Then you grow up and those hands change: sometimes you are the reassuring hand, others you are still the tiny one, held tight and protected. Following a recipe is just like trusting someone else and let them hold your hand. There are authors which I completely trust for the tasteful recipes they gave me year after year, for the friendly tone with which they explain all the steps as if they were sitting there at the table with you, or for the innate affinity given by chance or common experiences. Elizabeth David, Heidi Swanson, Molly Wizenberg, Tessa Kiros, Jamie Oliver, Pellegrino Artusi, Paolo Petroni and lately Ada Boni. I trust them, I know their voices and I let them hold my hand. Then, at some point of the walk, I free my hand, confident that the path is the right one, and I go further all by myself alone. That’s exactly what I did with this cake. Born from the need to use a lot of fresh ricotta given me by the cheese farm where I usually make a visit with my cooking class guests, it was at the beginning the ricotta cake described by Ada Boni in The Talisman Italian Cookbook , with orange peel, candied orange and cinnamon. I wanted it fresher and suitable for a summer Sunday, so I replaced cinnamon and orange with lemon zest and lemon thyme. 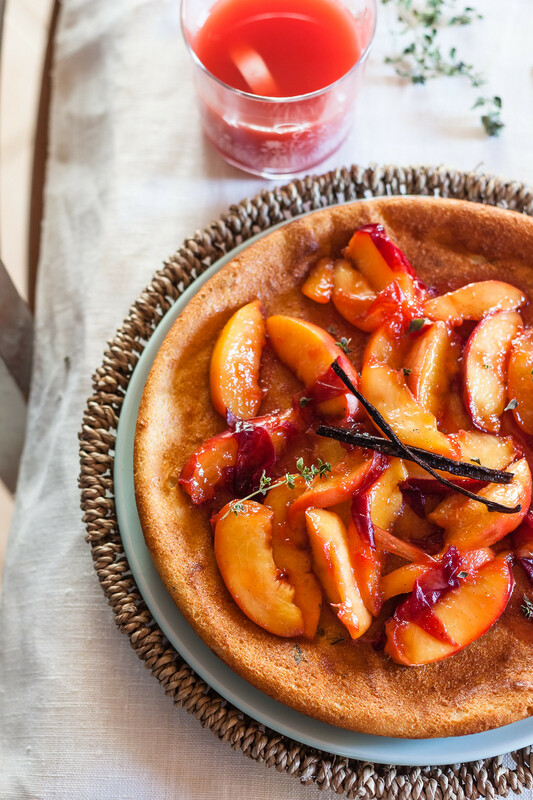 Then, since it was not as big and plump as I expected, I topped it with just caramelized nectarines: a Tuscan inspired and gluten free cheesecake – since I replaced the flour with potato starch. 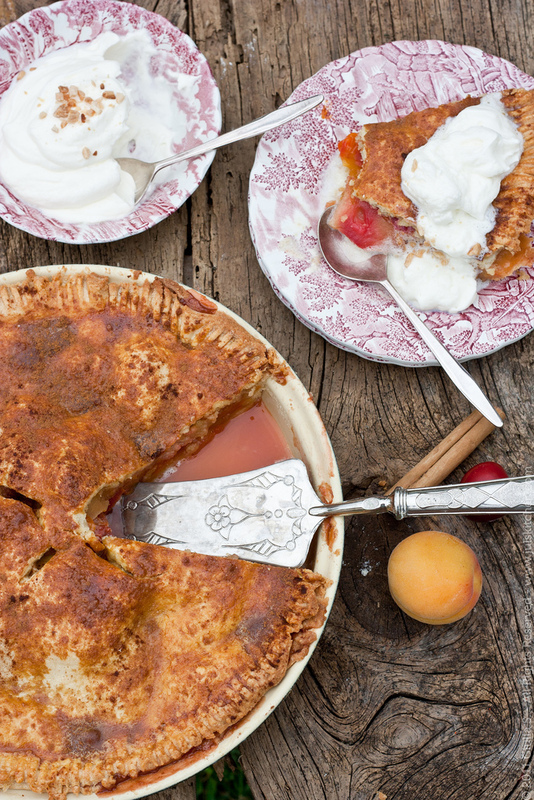 This is the cake for your summer afternoons! Sift the ricotta and mix it with a wooden spoon until smooth. Add the potato starch, raw cane sugar, egg yolks, grated lemon zest and lemon thyme leaves. Finally gently fold in the two whipped egg whites. Heat the oven to 180°C, butter a 24 round cake pan, dust with potato starch and scrape in the batter. Bake for about 50 minutes, until golden and firm. Let cool then unmould onto a serving dish. 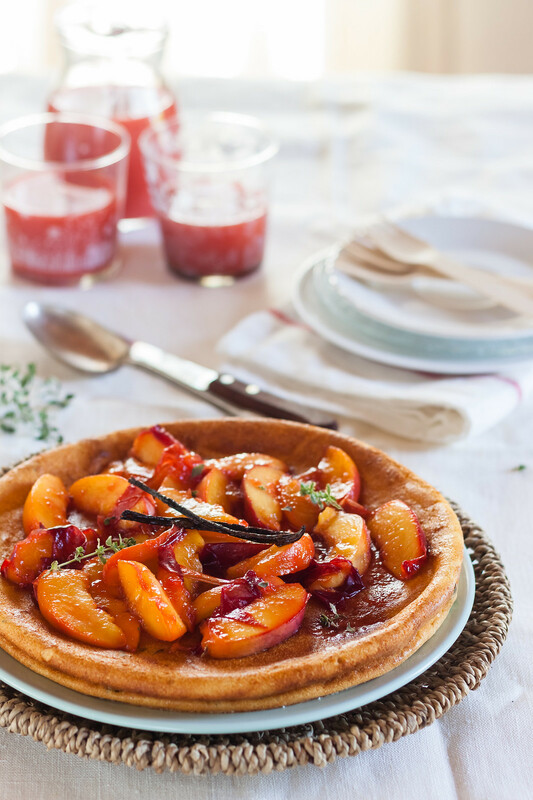 In the meantime, wash the peaches, slice them and cook them with lemon juice, sugar and vanilla for 5 minutes, then spoon them with their sugar onto the cake. Let’s try not to lose the sight of each other! Before leaving for a long weekend to take part to the Food Blogger Connect in London (YAY), some info per you! Summer is always a time of calm and peace for blogs, especially food blogs – well it’s not that everyone wants to turn the oven on with these temperatures, fully understandable – but I still find it an incredibly inspiring season, the fruit colours are inviting, the salads full of joy… to cut a long story short, I do not want to miss you! So here is how to keep the conversation going on! If you follow me on Twitter, FB page, Instagram and Pinterest I’m already quite present on your feed with breakfast pictures, Noa and silly daily adventures! With the retirement of Google Reader I activated a Bloglovin’ profile, so you can follow Juls’ Kitchen adding it to your favourite blogs to read. …then, the big flashing news! I have a newsletter! A real one, which I will send you every 15 days with a bunch of links and – listen listen – an exclusive recipe just for the subscribers. So hurry up and subscribe here if you don’t want to miss the rice and ricotta cake! 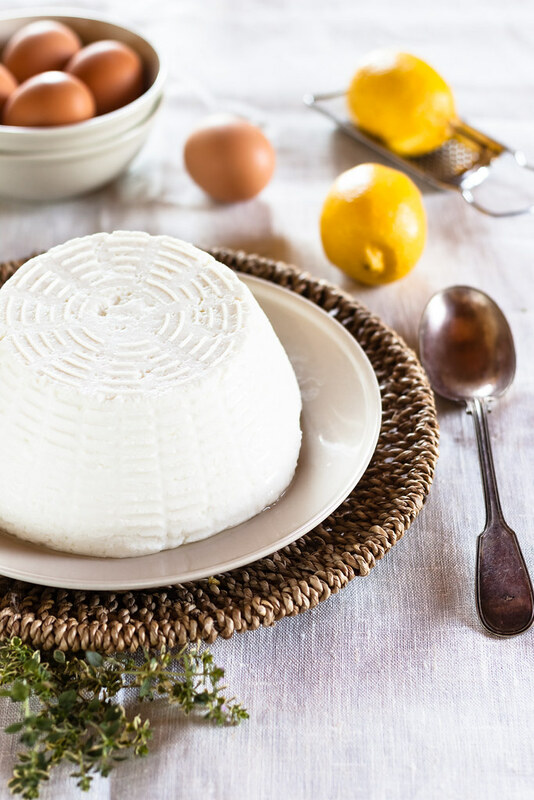 Gorgeous post, gorgeous cake and what a pretty looking Ricotta cheese!! Beautiful writing Juls!!! Your words about holding hands and trust evoke such beautiful images of warmth, comfort trust and happiness!!! And I LOVE the cake!!!! wow! I will try this when am back! :))) See you soon!!!!!! A wonderful dessert! So summery and delightfully fruity. I’m a big fan of ricotta. 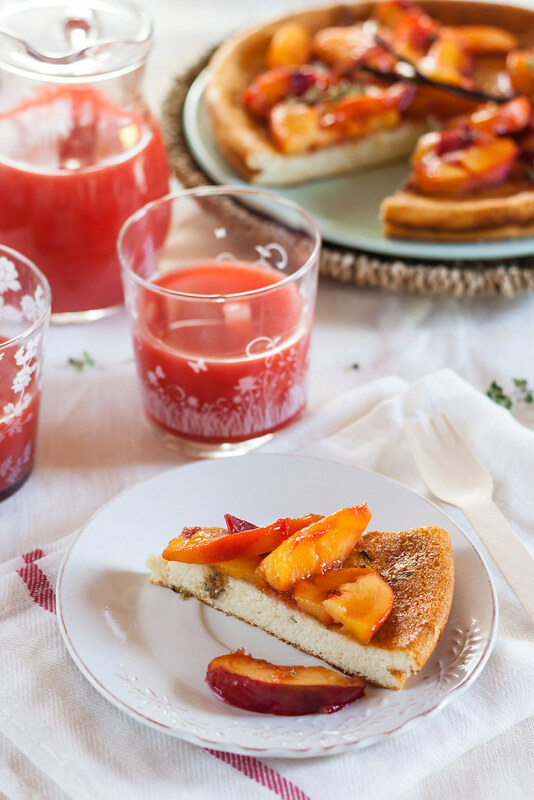 Beautiful cake, I love peaches with ricotta! Hey Guilia.. i just made this ricotta cake…and while walking hand in hand with you, I dared to let go …just a little.. Heres what I did.. I added custard powder instead of potato starch asI didnt have this… I also added the glorious scented seeds from a whole vanilla pod. I added orange and lemon zest. Because I didnt have potato starch to dust the cake pan I used natural almond meal and while I was at it I added some to the cake batter… But because I bake a little like my grandmother I didnt measure how much… Take a walk on the wild side I say !!! It is now in the oven sending beautiful vanilla citrusy smells through my kitchen. i have afriend coming for dinner later this evening and we will have this for dessert… A rare treat during the week, with some poached quinces and perhaps a few crumbled amaretti biscuits for texture. If I remember I will post you a photo on FB. 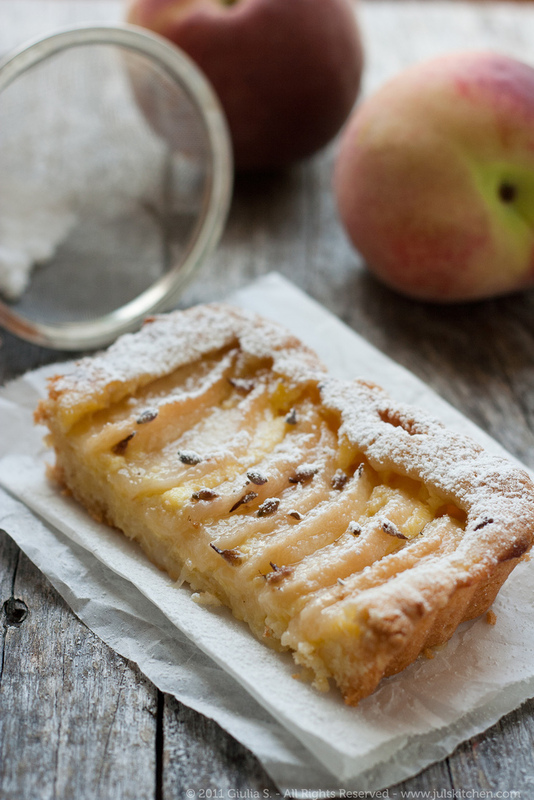 hey Guilia, i love your blog, its so interesting and the recipes so delicious. Plus the pictures amazing.i went once to Tuscany and fell in love with it; with all Italy, actually. Visited Florence, Lucca, Pisa. All beautiful. Wish i could go back there.Loved the food. This is my first visit to your site, having been sent your way by Judy Witts Francini. What a delight to read your words, and how wonderful that on my first visit, I find mention one of my favorites, Ada Boni. 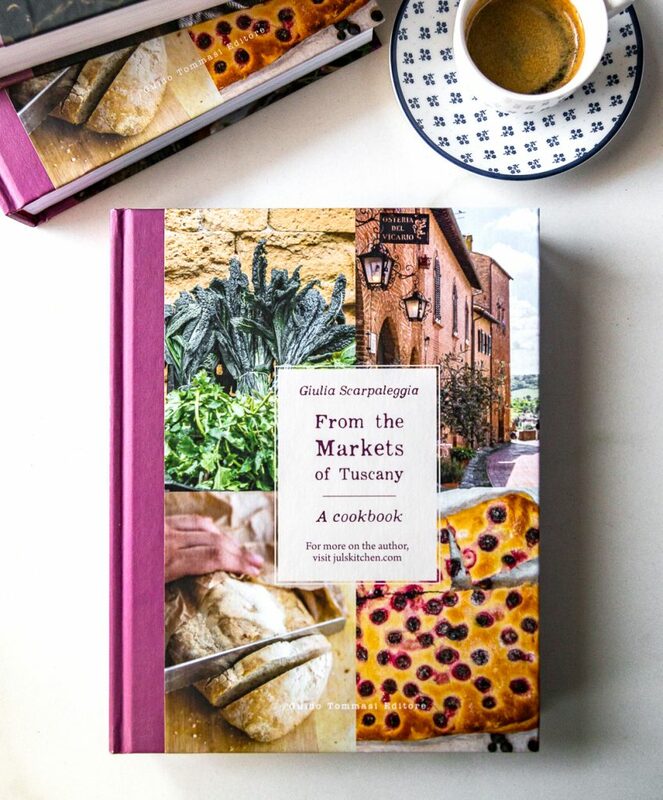 A fine teacher and an authoritative voice, she has influenced me for over forty years – since I first opened her book “Regional Italian Cooking. It is a pleasure to have found your site, and I will return often, I am sure. I so share your well worded thoughts about trust, for many years I’ve approached recipes in the same way. 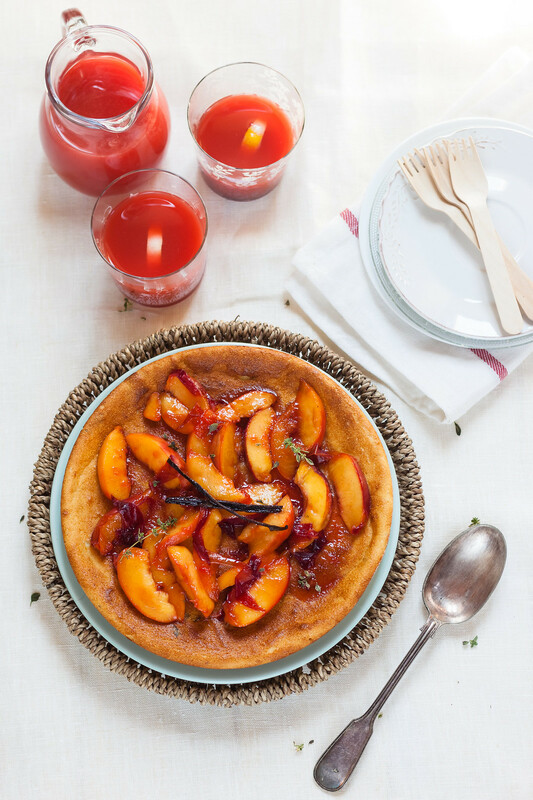 The Ricotta & Peach Cake exemplifies the wonder and simplicity of Italian food. Enjoy the Bloggers Connect and congrats on the newsletter. next post: Happy Birthday Juls!